I almost missed last week’s tasting. It was held at the Dancing Camel pub in Florentine neighbourhood and I rescheduled my bass lesson so I wouldn’t have to kill too much time between the lesson and the tasting. However, 3.5 hours before the tasting, 2 hours before the lesson, as my inner 16 year-old boy was practicing his Metallica, the alarm clock went off – I totally forgot I had a class that evening, at the university! Totally unprepared, I quickly printed out the material, cancelled the bass lesson and announced my abstinence from the tasting. As I was sitting in my Business Strategy class, all restless, I decided to join the tasting, although an hour later than scheduled. A frantic run to the bus stop and a miraculously quick ride and there I was at the Dancing Camel, an hour later, but the guys saved us a couple of ounces to taste from the bottles already sampled. It was worth coming, as by pure chance Stas and Vova brought a bottle of Firestone Walker Anniversary Ale – straight from The Book! 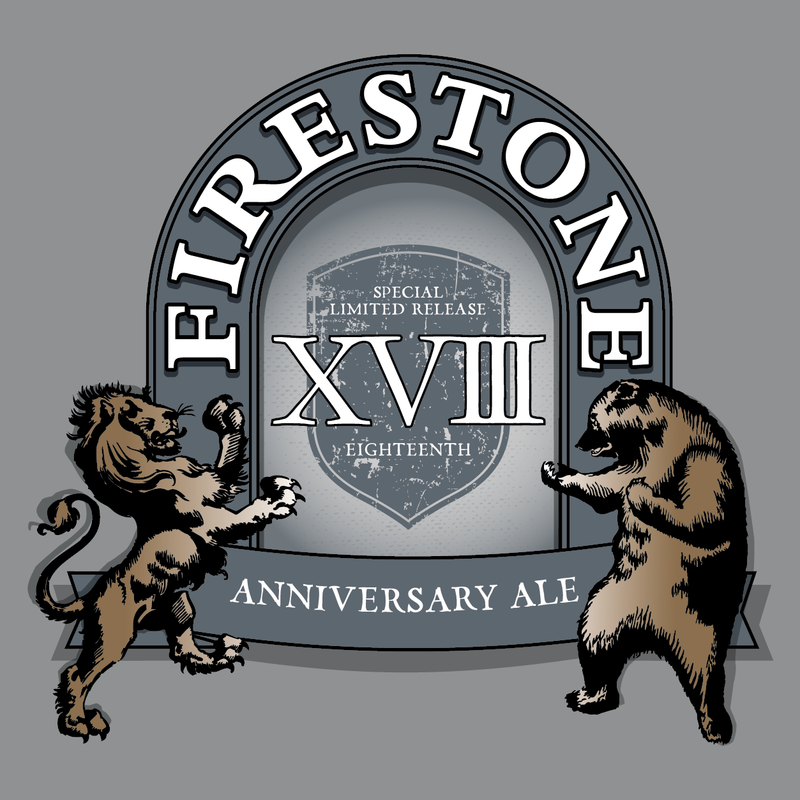 They brought Firestone Walker XVIII edition, a blend of 9 of the brewery’s oak barrel-aged creations, 13% abv. American Strong Ale. 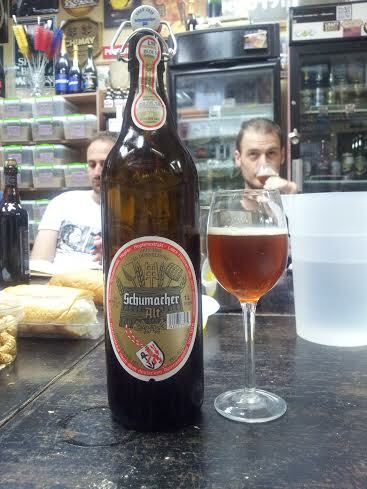 Pretty big beer it is – Black, with a very boozy nose and soft spiciness of nutmeg, cardamom and cinnamon. Taste is velvety, chocolatey, a little boozy and a little sweet, and also a little woodsy. Full body, no carbonation, vanilla, coffee and a little black pepper finish. Quite amazing, I’m glad I didn’t miss this tasting! 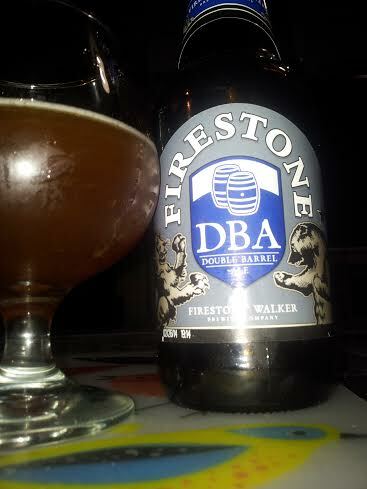 Firestone Walker Anniversary Ale is Beer #408 I must Try Before I Die. Compared to other Big Beer Countries, aka Belgium, Germany and the US, I don’t drink as many English beers and I’d like. 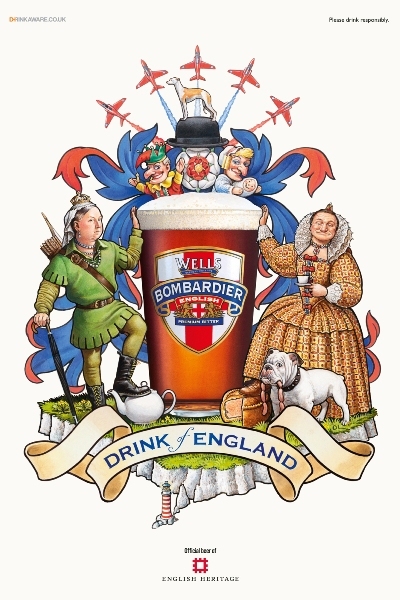 The reason behind it that not too many English beers are imported here and that England is not a destination my beer contacts frequent (I’m not even gonna talk about The Secret Agent and me, who as a couple visited the Land of Crass a miserable visit once in 2005). To us Israelis, England* is a more distant and more expensive travel destination than mainland Europe. 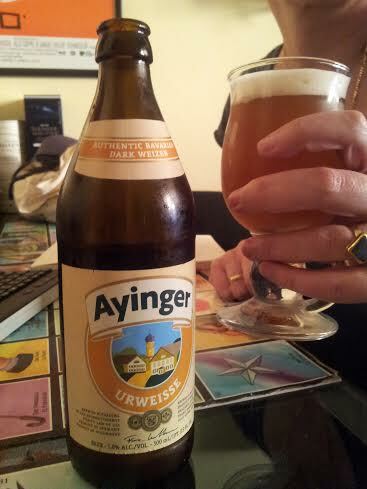 So compared to American, Belgian, German and even Danish beers, we don’t get to taste too many English brews. Thus, tasting 4 English beers at a tasting that took place a couple of weeks ago at The Beer Greek’s new and cool pad was quite a rare occasion. The fact that 3 of which are listed in the 1001 book just added to the joy. 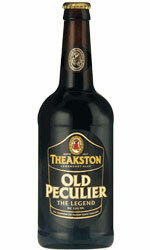 We were in charge of Old Peculier that’s brewed by Theakston from Masham, North Yorkshire. That’s 40 miles from where I lived for a year or so, back in the 1990’s. You can read about the history of Theakston Brewery and the origins of the beer’s name here. I hope you’ll also be willing to give it a try if you haven’t done so already, because this old ale style beer is good!It’s clear-brown in colour and has a thick, cream-colour head and has a smooth honey, malt, caraml aroma and sweetish malt and molasses taste. Delicate carbonation and bitterness that’s revealed in the finish, along with the long-lasting maltiness. Troubles began working with an English client and took the trouble to look for a beer from my list on his visit to a local supermarket: Wells Bombardier by Wells and Young. You can get some Wells and Young stuff in Israel: Young’s Double Chocolate Stout, McEwan’s shows up here sporadically, Wells Banana Bread Beer… Bombardier used to be sold here but its marketing stopped a while ago. This ESB pours clear bronze, has a rich malty aroma, tastes bitter but also slightly sweet. It’s a fun, drinkable brew indeed. isn’t it one of the coolest labels you have ever seen? 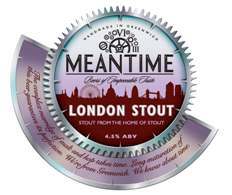 The Third English beer on my list was Meantime London Stout, courtesy of REL’s parents. It’s quite different from the Guinness-influence brews and that’s not unintentional – note the London in London Stout. One of the dominant smells I sensed, along with coffee and roast, is that of a rotten egg.It was strange and unpredictable, but not as disgusting as it sounds – quite the contrary actually. 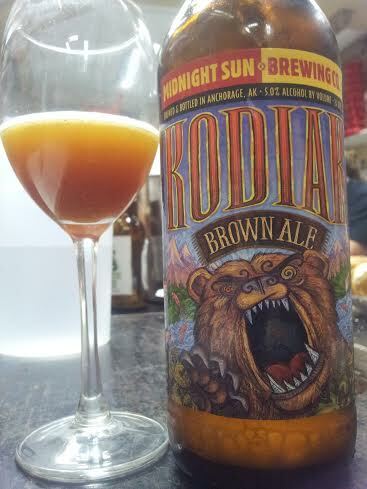 Lightly carbonated, roast and coffee tasting, it’s a a good and interesting beer. There are a couple of other Meantime Brewery beers listed in the book and I’m looking forward to try them all. We should start thinking about a UK beer tour. Late 2013? 2014? 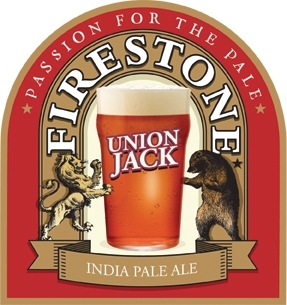 There was an American beer we shared in that tasting that’s worth mentioning here: Firestone Walker Brewing Co. is a Californian brewery, but they named their India Pale Ale Union Jack IPA so there you have it. An award winning beer, the bottle we got was probably a little old and therefore suffered from some skunkiness along with the bitter taste and the fruity, ripe melon aroma. Old Peculier, Wells Bombardier, Meantime London Stout and Union Jack IPA are beers #137, #138, #139 and #140 I Must Try Before I Die. *by England I mean London, of course. Few are the Israelis – and I assume that tourists in General – who take a Megabus outside the capitol, where everything is actually relatively cheap. I lived in England and it’s not THAT pricey once you leave central London.